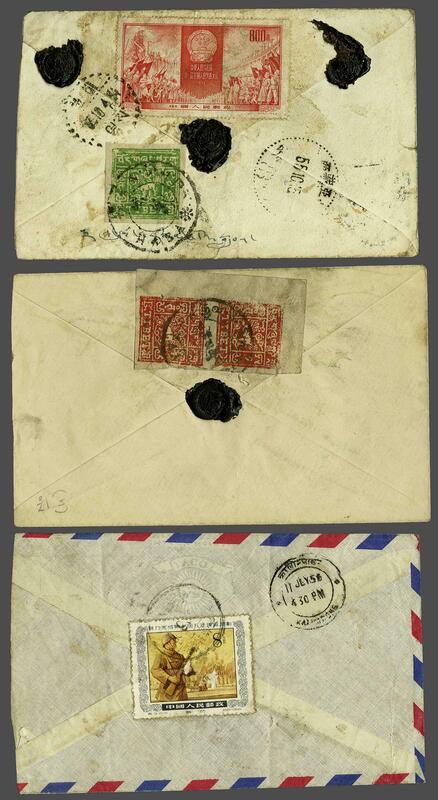 1954/56: Covers (3), two being PRC / Tibet combination covers, one with China 1954 National Congress $ 800 vermilion with Ibet 4 tr. emerald tied in Lhasa, 1956 cover with Tibet 2 tr. scarlet and 4 tr. green used from Lhasa to Kalimpong with China 1955 Five Year Plan 8 f. tied on reverse from Yatung. Variable condition but a scarce group.